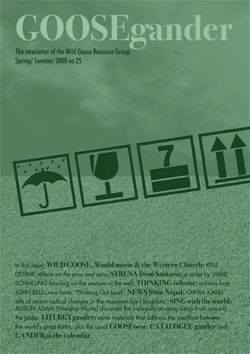 A SUPPORTING (World) subscription to GOOSEgander costs £45.00. plus a copy of that year’s WGRG liturgy booklet, worth around £4.50. and 10% off all purchases of WGRG books/CDs*. *SUPPORTING subscribers can place orders by post (enclosing cheque) or online here in the Shop. If ordering by post and enclosing a cheque, they can deduct the 10% of WGRG title value at source. If ordering online here, SUPPORTING subscribers’ credit card will be initially charged at the full standard amount; thereafter we will make a refund for the 10% of value to your card. ORDINARY (UK only) @ £4.50. ORDINARY+LITURGY (UK only) @ £8.50. SUPPORTING (UK only) @ £40.00. DOWNLOAD @ Free/ extracted 8 page version.